That last one is what caught my attention. 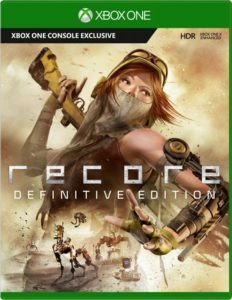 Recore has a surprisingly great throwback to Playstation 2 era gameplay and a cool setting that rejects the standard Asimov rules and presents a unique vision of AI. It is fantastic, right up until you realize they didn’t finish the game. I don’t mean unfinished like Mass Effect: Andromeda from earlier this year. That game had some problems; missing polish around the character animations, some broken cut-scenes, and the general feel of a game that needed a few more months to work out the kinks. Recore is straight missing pieces of the game, and not even hiding it. The companion ‘Corebots’ have multiple chassis with abilities to climb rails or break through specific walls. Each of these have specific modification parts you can find scattered throughout the world, including T8-NK parts. Parts that cannot be used, since they are for a chassis that isn’t in the game. A bot with an ability to drive over mud, allowing access to areas that are completely visible and full of collectables and platforming puzzles. Areas that are ultimately unreachable. This new edition of the game is set to include the T8-NK, a new adventure called Eye of Obsidian, and a host of other improvements. I am just glad to see owners of this game are getting it all for free on August 29th. ← Previous Previous post: Hollow Knight – Part 1 – Map Please!